We are well experienced in manufacturing and supplying wide range of workshop tools. Lathe Tools are available in different shapes and functionality and it is one of the genuine and reliable companies that supplies cost effective and high quality equipment to different parts of the world. 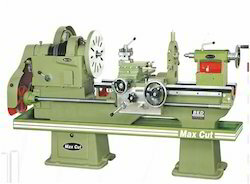 Bhavya Machine Tools offers various types of lathe including V-Belt Drive Lathe Machine. These lathes are used for accurately machining comparatively hard materials.Our lathes are compact and offer better value for money. They are used in power plants, steel rolling mills, tool rooms, ship building, repairing shops, paper mills, workshops, textile, oil, mining industries etc. Bhavya Machine Tools offers various types of lathe including heavy duty lathe machine.The devices incorporate the latest technology to ensure improved performance.